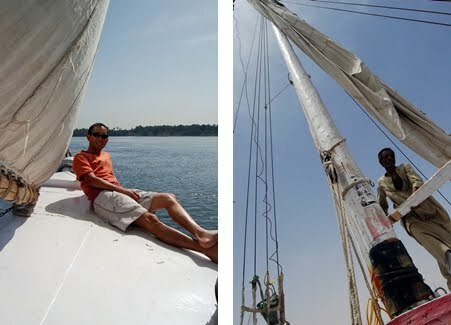 Sitting on the side of the felucca, I let my feet drag along the clear, emerald green waters of the Nile. Looking down, seaweed and water grasses sway in the current, and little fishes dart between their foliage. After a quick swim in the waters to cool off, lunch is served. Today, it would be fresh Nile Perch, caught by Nubian fishermen barely hours ago, with a side of rice and a salad of fresh tomatoes, cucumbers and arugula. Cooked and served fresh on board, the meal is capped off with Karkady – a sweet delicious Hibiscus flower tea. With a full stomach, the gentle rocking of the felucca as it sails along makes my eyes heavy. Soon, it would be time for a nap. While I drift off to sleep with the sounds of lapping waves against the side of the felucca, I hear the attendant loading the cooler with beer and ice, ensuring that they will be perfectly chilled when I awake. Ah...even Cleopatra never had it this good! Meeting up with Dairn and Yolanda (Yodi), the Canadians I met in Siwa, and joined by Christa, Yodi's sister, we arranged for a private cruise down the Nile from Aswan to Edfu on a felucca, a traditional wooden sail boat popular in the eastern Mediterranean region. For three days and three nights, we sailed and floated, stopping to swim in the cool, clean waters, visiting remote Nubian villages and islands and marveling at the temples of Kom Ombo and Edfu. The captain of the boat, Morad, a laid-back easy-going Nubian, owns his own felucca and would only take independent travelers on his boat, refusing to work with tour groups and Egyptian guides. Always smiling, he would constantly ask us if everything was good and break out singing the Bob Marley classic, “Everything's Gonna Be All Right" while smoking his sheesha. All along the banks of the Nile, a lush green belt of palm, fruit trees and papyrus grasses hug the water's edge, slowly giving way to brown, barren, desert hills. Occasionally, ancient ruins would lay crumbled and abandoned along the banks, marking the spot where they have stood for thousands of years! It is not inconceivable to image Mark Anthony wooing Cleopatra with this very same view while on a romantic cruise down the Nile. With an ungraceful belly-flop splash, we all make a running dive into the Nile from a pristine sandy beach off the Western bank. For an instant, the air is sucked out of your lungs and your skin tightens with pins and needles all over. The water is surprisingly cold, perhaps made worse when contrasted with the warm, dry breeze blowing from the North. Our daily swim in the Nile offered us a chance to wash off, and gain relief from the mid afternoon heat. Captain Morad was always ready to comply with our requests for a swim, and would anchor the felucca at some of the best swimming spots along the way. Aside from the occasional plastic bottle and trash floating by, I was pleasantly surprised at how clean and clear the water of the Nile is, with visibility of about 2 meters, it is teeming with fish and other wildlife. Being a Nubian, Captain Morad would stop at various Nubian villages along the Nile to visit his friends. Greeting us with a welcome party of village kids chanting “Hello!...Hello!”, the friendly villages would invite us on shore for a picnic lunch of stewed fish and bread, and show us small facets of traditional Nubian life, including their baby pet crocodiles! These little farming communities grow a variety of fruit crops, from mangoes to bananas, and various vegetables – still relying on traditional farming techniques such as cow-powered water pumps and donkey-powered plows. One of the biggest highlights of the trip was visiting the camel market in the town of Daraw. Every weekend, camels are brought in from Sudan to be sold and traded to buyers all over Egypt! Hundreds, possibly thousands of camels lie waiting in herds while their owners huddle with potential buyers, negotiating and bargaining for the best possible prices. Those animals that get sold are led off in long caravans on foot, or loaded onto trucks to be driven to their new homes (or to the slaughterhouse). Going on a felucca cruise is without a doubt the best way to see the Nile and the communities that live along its banks. We were indeed fortunate to have found Captain Morad as other travelers we met after our cruise told us of unscrupulous feluccia captains who would quote ridiculously low prices to lure the unsuspecting budget traveler, only to nickel and dime their way through the entire cruise by providing only the most basic of necessities, and charging extra for everything else! Captain Morad however, was upfront with the costs. There was never any hidden charges and he provided us with some of the best home-cooked food at all-you-can-eat quantities. Spending three days on a felucca is definitely not for the faint-hearted. There are no facilities on-board, and do not expect to be able to take a hot shower. Using the bathroom means doing what ancient Egyptians have been doing for all eternity, and yes, mosquitoes do come out at night! But for those brave enough, they will be rewarded with relaxing days sailing on the peaceful Nile, breathtaking views with scenery unlike any other, and a glimpse into a disappearing culture and lifestyle of the ancient Nile settlers that have changed little since the Arabs invaded Egypt, ushering in an era of Islam, over a millennium ago. Looks like a Stamped Must!